Where do hostile attitudes towards immigrants come from? ‘The media and politicians’ often comes the cry from those on the left, seeing the hostility as something brewed by outside forces for their own ends. ‘People’s own experiences’ is often the response from the right, arguing that people feel worried both culturally and economically from interacting with immigrants. In perhaps my favourite two papers that I’ve read in the past 12 months, Georgetown academic Dan Hopkins shows that BOTH of these two processes come together in what he calls his theory of ‘politicized places’ – or what I think of as the politicization of everyday experience. This seems only too plausible to me – but a plausible theory is no substitute for evidence. The meat of Hopkins’ papers, then, are the 4-5 ways that he tests this theory over the course of two papers (one in the American Journal of Political Science, and one in the British Journal of Political Science), of which I present my favourite three here. In all these cases he is looking at the interaction of political rhetoric and immigration in people’s local areas (hence ‘politicized places’). The first test of the theory is to look at the link between local immigration levels and immigration attitudes in the US, and how this changes over time. The figure below shows that the salience of immigration in the media (ABC News, CBS News and USA today) varied considerably over the 1990s and 2000s, and in his APSR paper Hopkins links these to (cross-sectional) data on American’s desired level of immigration. The results are exactly as predicted – there is a strong, statistically significant interaction between immigration salience and local trends in immigration. The size of this effect is moderately large. 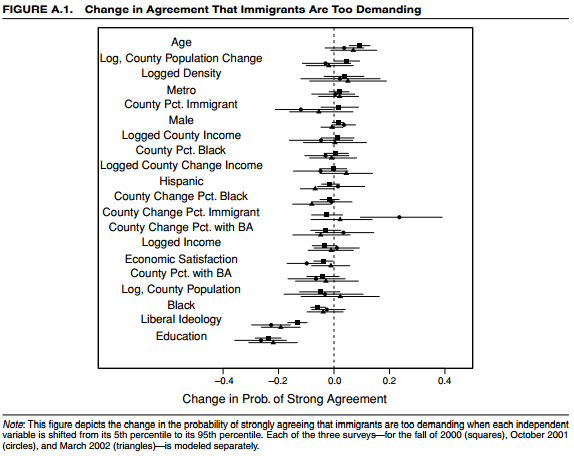 If we take the minimum media salience in 1994, then people in the areas with the least change in immigrants (5th percentile) were 7 percentage points more likely to say that immigration should stay the same or go up, compared to areas with the greatest change in immigrants (95th percentile). When immigration was at its maximum level of salience in 1994, the model suggests a 15 percentage point gap – double the size of the area effect. The previous analysis looked over a long period of time using repeated cross-sectional data; in his second APSR analysis, Hopkins looks over a short period of time looking at changes in attitudes within the same group of people, using longitudinal data. The time period here is critical; it looks at attitudes just after the 9/11 attacks (interviews were done in October 2001), compared to both shortly before (Fall 2000) and after (March 2002), and sees how local immigration relates to the view that “immigrants are getting too demanding in their push for rights”. Again, Hopkins finds strong support for his hypothesis – rising local levels of immigration are associated with more hostile attitudes to immigrants, but ONLY just after 9/11, with no significant effect either side of it. The chart below makes this point really well – it shows an incredible stability in the patterns of immigration attitudes (perhaps unsurprisingly, given that these are the same people in each wave), except for a sudden, sharp and temporary shift in the impact of local immigration around the time of 9/11. OK, so by now we’re getting pretty convinced – but just to really make the point, Hopkins uses panel evidence from another country (the UK) and with a completely different short-term change (the deliberate stirring up of anti-immigrant opinion by politicians). 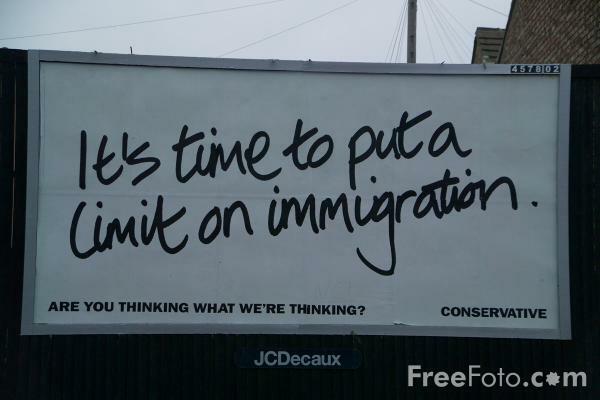 During the 2005 general election campaign, the Conservatives campaigned hard on immigration in a desperate (and entirely unsuccessful) bid to reverse their situation in the polls – one of their posters is at the top of this post, with the now-infamous tagline, ‘Are you thinking what we’re thinking?’. 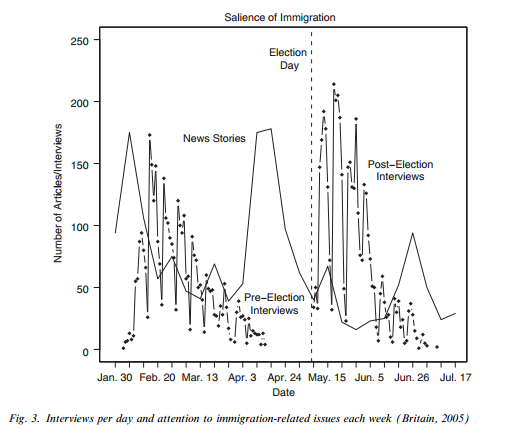 Because this was an election period, there was a panel study that asked people both BEFORE and AFTER the election whether immigration was the most important issue facing their country – the change in coverage and timing of the interviews is shown below. As the chart shows, there was a big spike in attention to immigration issues during the election campaign – although it should be noted that such spikes weren’t unprecedented, even within that year. And again, Hopkins finds that people living in areas with more immigrants (the level rather than the trend due to data limitations, unlike above) were more concerned about immigration – but only after the election, and not before the campaigning properly started. All in all, I think this is a brilliant set of analyses that is hard to argue with (however much we can quibble with one detail or another in each analysis). But more than that, I think it captures something powerful about the way that people’s attitudes are formed – a messy process that depends on people’s everyday experiences, but mixed up with ways of thinking that are prompted by the media and politicians. And this is something we’ll be coming back to later in the year, in the context of attitudes towards benefit claimants. Until then, keep an eye out for Dan Hopkins’ creative and convincing work. This entry was posted in Blog posts and tagged immigration, political attitudes. Bookmark the permalink. btw, I should also say a huge thanks to Charlotte Cavaille for flagging these articles to me!